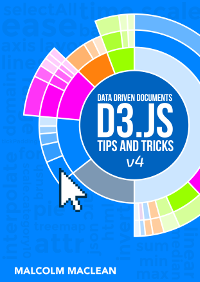 D3.js Tips and Tricks: How (and sometimes why) someone downloads a free eBook. How (and sometimes why) someone downloads a free eBook. 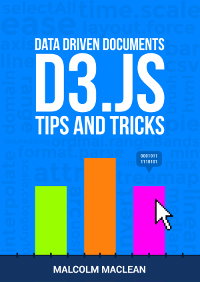 At the end of 2012 I published the first version of the book D3 Tips and Tricks. 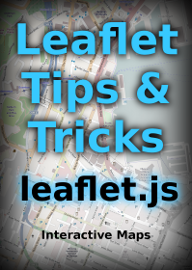 I tried to distribute it a couple of different ways before coming across the Leanpub service at the start of 2013. I have been publishing with them since that time (they do a great job). One of the points of difference that I wanted to make was to have the book available for free. The idea being that I would learn about d3.js while writing and people could hopefully derive some benefit at the same time. The price shouldn't be a barrier to the decision about whether a person downloads the book or not (I'm not preaching this as a model for everyone, but it suits me). Leanpub's service fitted this approach perfectly. 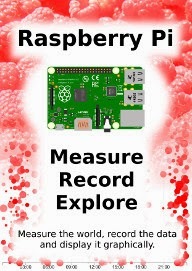 A user could download the book and they could do so for free or donate if they felt like it. To do this on Leanpub an author simply sets their minimum price for a book to $0 and a recommended price for what they believe will be a reasonable cost. Over the two years that the book has been available (at time of writing) it has been downloaded almost 19,000 times. I figure that's pretty good and that in some way I've helped the Open Source community. In the process of implementing a method of measuring and displaying the passage of a cat through a cat-door over time I built a graph that showed events indicated by both date and time on separate axes. It was then that I figured that this would be useful for picking any trends in how people downloaded my books. Luckily Leanpub has an API for accessing the history of book activity and I was able to download it and store it in a database for exploring. This was really fascinating because it showed some distinct areas of interest. There was a definite variation in the time of day that books were downloaded and it had a feel that there was an increase over the years. However, there was a marked difference that occurred at the beginning of 2015. There is a distinct reduction in the number of books being downloaded. This was puzzling. I could think of no reason that this had occurred. 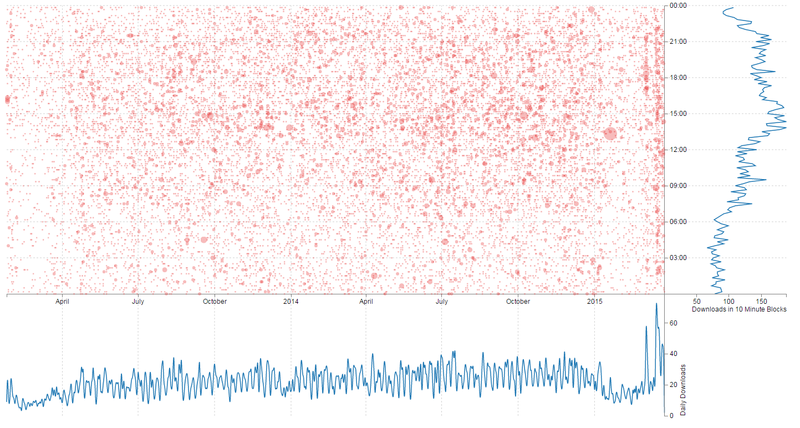 It wasn't until I used the scatter-plot to show all the instances where people had donated that it dawned on me. There had been no variation in the overall amount that is donated. This is fairly constant and the graph above shows the size of the dots represented the amount that is donated. 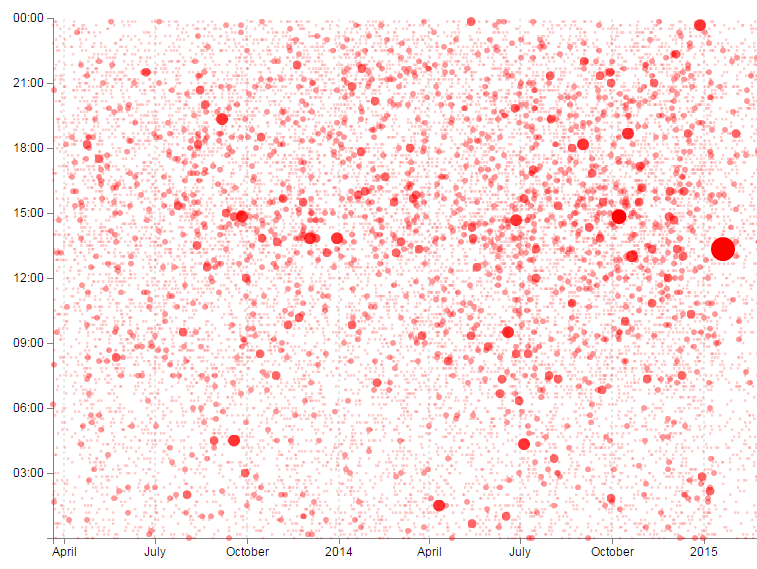 The thing that will be interesting is the consistency in the size of the dots at the beginning of 2015. There are a lot of dots of pretty much the same size. Meaning that when people donated in this period, they did so fairly consistently. So now we have three interesting factors for the period in question. The amount donated became more consistent. That's when I remembered a change that I had made to the book at the beginning of the year. While the minimum price remains the same at $0 so that people can download for free, I raised the 'recommended' price to $4.99. (it had previously been $1.99). That one change meant that fewer people downloaded the book. It was still free, you downloaded it in the same way, but the recommended pricing influenced how many people downloaded a free book. There could be a bazillion reasons for this I'm sure. My personal favorite was that when the book was presented on the web page, the button that you press to download the book used the words 'Buy Book' (or similar). My theory is that at $1.99 people were more inclined to click the button and then reduce the amount donated to $0 than if the presented price was $4.99. I left the minimum price at $0 but changed the recommended price to $0. When you do this the button to download changes to 'Get your free eBook' (or similar). The updated scatter-plot with other graphical goodness shows the $4.99 gap and the subsequent change after reducing the recommended price to $0. There is certainly an increase in downloads which I will continue to monitor with some interest. I will leave it like this for a month or so and see what changes. If you're interested in the graph you can find the code for it and the graph here. I hope to add the graph and a brief description of how it does it's thing to the blog and the book in the near future. Awesome post, Malcolm! I have also developed and sold a book on Leanpub (https://leanpub.com/ElectricFertilizerBook), currently off leanpub while I wait for kdp direct to expire. This method could be a great way to help determine optimal pricing.